This post has been updated throughout the day. County Executive Maggie Brooks is speaking to the media at 5:30 p.m.
More arrests have been made as a result of the ongoing grand jury investigation into local development corporations with links to Monroe County government. Among those facing charges is Robert Wiesner, husband to County Executive Maggie Brooks and a retired captain for the Rochester Police Department. Charges were lodged today against four people in an ongoing probe into county-linked LDC's. Also facing charges are Nelson Rivera, the county's former chief information officer, and John Maggio, president of Navitech Services Corp. Daniel Lynch, president of Navitech and a former sales executive for Siemens Building Technologies, was charged a few weeks ago in connection with the probe. But the indictment unsealed today expanded on those allegations, and Lynch now faces a slew of additional charges. All four men pleaded not guilty during arraignments this afternoon. Acting Supreme Court Justice Robert Noonan, a Genesee County judge who is handling the cases, released all of the defendants on their own recognizance with the exception of Lynch, whose bail was set at $25,000. Lynch has 24 hours to post his bail. All of the defendants turned themselves in to authorities earlier today. The state Attorney General's Office released a press release on today's arrests. The indictment lays out allegations that the defendants all played some role in an alleged "elaborate bid-rigging scheme," says the press release. The full press release, which contains the charges, follows this story. "We think there's no merit to this case and we intend to defend" against it, said Maggio's attorney, David Rothenberg, during arraignment proceedings this afternoon. 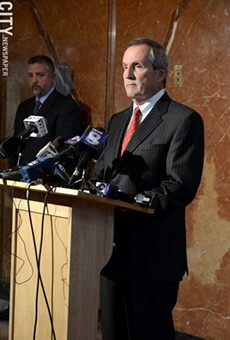 Outside of the courtroom, James Nobles, Wiesner's attorney, also disputed the allegations. He says that he's received little information about the allegations against his client, other than the charges that Wiesner faces. The two counts amount to bid-rigging allegations, Nobles said. He's also filed a motion to have the charges dismissed because Wiesner didn't have a chance to testify to the grand jury, Nobles said, despite a request to do so. "This is a political indictment," Nobles said. The history of the LDC controversy is complicated. Two county LDC's are thought to be at the center of the grand jury investigation by the state Attorney General's Office and the FBI. And those investigations are thought to be based on critical audits from the state Comptroller's Office. One of those audits centered around a county contract with Upstate Telecommunications Corporation — a contract that Rivera was in charge of. The county contracted with UTC to provide information systems, including phones and computers. But in the audit, the Comptroller's Office alleged that the county used a flawed process, meant to steer the contract to UTC, which would ultimately contract with Siemens Building Technologies. And that company, says the audit, has significant connections to current and former county officials. And when Siemens stopped providing services to governments, it assigned its contract to Navitech, whose chief operating officer is Stephen Gleason, the county's former chief financial officer. Auditors found the process followed by the county to obtain the services was not competitive and favored Navitech. The seven proposals received in response to the county's request for proposals were not equally evaluated. Auditors also learned that Navitech had been provided an early draft of the RFP and provided with additional details unknown to the other vendors. Some media have also reported that the Monroe County Water Authority, which has dealings with Monroe Security and Safety Systems, has hired a law firm with experience in criminal proceedings. ROCHESTER – Attorney General Eric T. Schneiderman and Comptroller Thomas P. DiNapoli today announced the indictment of four individuals for an elaborate scheme to rig the bidding process for several multimillion-dollar contracts. Nelson Rivera and Robert Wiesner – both former Monroe County public officials – along with John Maggio and Daniel Lynch – two local business executives – have been charged with a total of 43 felony counts, including Money Laundering, Conspiracy, Falsifying Business Records, Offering a False Instrument for Filing, and Combination in Restraint of Trade and Competition. The indictment alleges that the four men colluded to steer the process for awarding Monroe County contracts, funneling money to preferred vendors. Lynch and Maggio conspired to launder roughly $2 million through payments from Navitech Services Corporation to Treadstone Development Corporation. Separately, Lynch laundered more than $100,000 in stolen proceeds from contracts between Catalog & Commerce Solutions and both Siemens Building Technologies and Upstate Telecommunications Corporation (UTC). In both cases, the defendants engineered their schemes by creating fake contracts, inflating subcontracts, and submitting false invoices. The proceeds were used by these individuals for their personal benefit, including luxury golf tournaments and payments to political campaign accounts. “These officials laundered more than $2 million in taxpayer money through a complex bid-rigging scheme and thought they could get away with it. This shows how bad it can get when government operates in the shadows," State Comptroller DiNapoli said. "Through our joint task force with the Attorney General’s office, our auditors and investigators were able to reveal these hidden abuses through not one, but two, local development corporations. It’s time to give the public full disclosure of the use of its money. I commend the Attorney General Schneiderman and his staff on the prosecution of this egregious wrongdoing." The criminal investigation stemmed from two Comptroller audits, which found irregularities in the financial activities of UTC. The Joint Task Force on Public Integrity is a cooperative effort between Attorney General Schneiderman’s and Comptroller DiNapoli’s offices to maximize their resources and root out public corruption. Former Chief Information Technology Officer of Monroe County Nelson Rivera, 37, of Hilton, is charged with six felonies, including four counts of Combination in Restraint of Trade and Competition and two counts of Falsifying Business Records. Former Director of Security for the Monroe County Water Authority Robert Wiesner, 66, of Webster, is charged with two counts of Combination in Restraint of Trade and Competition. John Maggio, 58, of Pittsford, a certified public accountant and owner of Navitech Services Corporation, is charged with 10ten felonies, including three counts of Combination in Restraint of Trade and Competition, two counts of Grand Larceny in the Third Degree, one count of Money Laundering in the Second Degree, one count of Conspiracy in the Fourth Degree, two counts of Falsifying Business Records in the First Degree, and one count of Offering a False Instrument for Filing in the First Degree. Daniel Lynch, 50, of Rochester, a former sales executive of Siemens Building Technologies and current president of Treadstone Development Corporation, is charged with 25 felonies, including four counts of Combination in Restraint of Trade and Competition, three counts of Grand Larceny in the Second Degree, six counts of Grand Larceny in the Third Degree, two counts of Money Laundering in the Second Degree, one count of Money Laundering in the Third Degree, two counts of Conspiracy in the Fourth Degree, six counts of Falsifying Business Records in the First Degree, and one count of Offering a False Instrument for Filing in the First Degree. Today’s indictment supersedes the indictment against Lynch that was unsealed on October 15. The defendants were arraigned before the Honorable Robert Noonan, Acting Supreme Court Justice of the County of Monroe. Rivera, Wiesner and Maggio were released on their own recognizance. Bail was set for Lynch at $25,000 cash or $50,000 bond. According to the indictment, instead of using a fair and competitive process to award contracts, the defendants engaged in a scheme to direct the contracts to favored corporations, including Siemens, Treadstone, and Navitech. The defendants provided insider information to the favored corporations, which was not available to other companies responding to the Request for Proposals. As a result of this collusion, in 2005, Monroe County entered into a $99 million contract with UTC, a local development corporation that provides upgrades to the county’s information technology systems, and in 2010, a $212 million contract with Monroe Safety and Security Systems Local Development Corporation (M3SLDC), an LDC that provides upgrades to the county’s public safety and security systems. As a result of the scheme, UTC awarded Treadstone a $175,000 contract in May 2009. As part of the implementation of the UTC contract, both UTC and Siemens entered into subcontracts with Catalog & Commerce Solutions, LLC (CCS), a Pittsford-based website and e-commerce services company. Lynch inflated the value of these contracts and agreed with another individual known to the grand jury to cause CCS to submit inflated invoices to UTC and Siemens. The proceeds of payments made by Siemens and UTC to CCS were then deposited into special bank accounts that Lynch used for entertainment expenses, as well as to send money to Maggio, Navitech, political campaign accounts and charitable organizations. The indictment alleges that Lynch engaged in money laundering to conceal the theft through inflated CCS invoices. Maggio created false invoices to mask payments made to himself and Navitech. Lynch and Maggio created a copy of one of these false invoices to be provided to the Attorney General's Office in October 2012 in response to a subpoena – an effort to conceal the scheme from investigators. Lynch and Maggio are further charged with laundering the proceeds of the bid-rigging scheme through payments made by Navitech to Treadstone totaling more than $2 million. The nature of this conspiracy was to conceal the true ownership and control of proceeds paid to Navitech, a company created by Lynch and Maggio to assume responsibility for Siemens' contract with UTC in December 2008. The Attorney General expressed his appreciation to the Office of the New York State Comptroller for its assistance in this investigation and to the Rochester office of the Federal Bureau of Investigation and the Office of the United States Attorney for the Western District of New York. This case is being prosecuted by Assistant Attorney General Ann Marie Preissler, under the supervision of Public Integrity Bureau Deputy Chief Stacy Aronowitz, Chief William E. Schaeffer, and Executive Deputy Attorney General for Criminal Justice Kelly Donovan. The prosecutors were assisted by Investigator Christopher Reidy and Supervising Investigator John Serrapica, under the supervision of John McManus, Deputy Chief Antoine Karam and Chief Dominick Zarrella of the Investigations Bureau. Also assisting in the investigation were Legal Support Analyst Jacqui Brown and Investigative Analyst Brian Selfon.